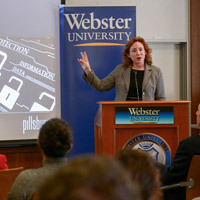 Tunstall's weeklong visit included a public talk, "Cybersecurity: Its Impact on Daily Life and Privacy." Mercedes Tunstall concluded her visit to Webster University's home campus last week as the second Woodrow Wilson Fellow from the Council of Independent Colleges (CIC). Webster's president, Elizabeth (Beth) J. Stroble, is a member of the CIC's Steering Committee on the Project on the Future of Independent Colleges. 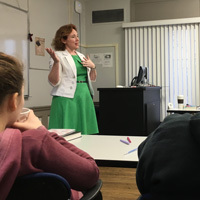 Tunstall spent April 4-8 in St. Louis visiting faculty members, students, alumni, wider community members and a public event in the Contemporary Conversations for a Connected World speaker series. Her background and expertise is of particular interest to students in the classes she visited in the legal studies, cybersecurity, international human rights programs, and communications and journalism programs, the latter of which included a meeting with student journalists for The Journal. She is an attorney practicing in Washington, D.C., where she focuses on e-commerce, privacy and cybersecurity issues, and the use of social networking sites for marketing and crowdsourcing purposes. Tunstall previously served as a staff attorney at the Federal Trade Commission and has testified on the subject of virtual currencies before U.S. Senate. Her April 5 "Contemporary Conversations..." talk, "Cybersecurity: Its Impact on Daily Life and Privacy," examined the ongoing battle to secure our digital information. In addition to discussing social media, privacy, legal issues and more in class visits, she also met with local leaders from the banking and financial services industries to discuss developments in e-commerce and consumer protection. 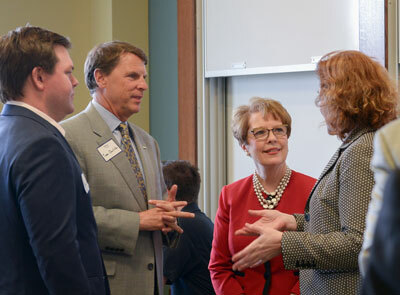 Shelley Seifert, chief administrative officer and executive vice president of First Bank, co-hosted one such event in the Arcade Building at Webster's Gateway Campus in downtown St. Louis. Overall, Tunstall's visit provided several opportunities for meaningful, student-centered interaction, providing students a unique glimpse into the world of tomorrow and Webster's community partners a look into the major e-commerce and cybersecurity issues of today.